Here are a few more snow pictures taken from my dock. This dock needs some TLC, but in its heyday it was quite the gathering place, especially for my father and his fishing buddies. And for me and my sisters back when the creek would freeze solid enough to walk on. nor that gill net have been used for decades. and the tide comes way over the dock. It's as if it refuses to budge. It's holding on. Watch out for that last step, it's a doozy! Although I don't get out here often enough, I do enjoy a walk out on this dock. and tonight's basketball game is also postponed. Instead, the varsity teams will play Saturday night at home against West Point starting at six. I hope your weekend is a good one. Once upon a time in a week otherwise known as Way Too Overwhelming, Mother Nature decided to give us a snow storm. And before this story advances any further, on behalf of my car with over 175,000 miles and my cardiovascular system with borderline high blood pressure, I'd like to take a moment to thank Mother Nature from the bottom of my heart for the gift of a few days of NO DRIVING!!! rest. It all began Tuesday night, a night that was supposed to be spent at King and Queen High School watching a basketball game after a day of work and then physical therapy for my aching back. Instead? Game cancelled. No need to drive anywhere. Instead I worked on the federal financial aid forms that are due for my son's college experience. A trip to the dentist might have been an easier task to complete but would have required driving. Anyway, I got that hideous tedious task completed early. The next morning I awoke to the glorious gift of no work, no school, college financial aid forms complete and no place to be, nowhere to go. Back when herons were called pterodactyls I was a kid, the creek froze over often. We could walk directly across here (aka Miller's Cove of Queens Creek) without any fear of falling through. for some good slipping and sliding but instead realized that even at low tide the ice wasn't strong enough. So they shifted their Let's Kill Mother With Worry activities to the John Deere gator, which they used to pull their sled. No teenagers were harmed during their motorized sledding activities. Their mother's cardiovascular system also seems to have survived, just barely. Mother Nature's gift keeps on giving, because school and lots of things that would otherwise require driving long distances are also on hold today. After a weekend visiting with my friend Meg in Maryland, I'm bracing for a brutal week ahead. In addition to my normal commute, I'll drive to away basketball games Monday and Tuesday nights. Monday night is against Charles City, Tuesday is King William. Friday we play home against West Point. Based on the fact that I won't walk in the door (after leaving at 6:15 a.m.) until after 11:00 p.m. these next few nights, and the fact that college financial aid forms are due this week, and a thousand other excuses reasons, blog posts will be sparse. Here are a few final shots of this week's snowfall taken from my back yard. The temperatures remain frigid, so it's lingering longer than usual. The weekend is finally here. Barring anything unforeseen, I hope to see my blog friend Meg and her family on Saturday when I make a quick trip north. I hope your weekend is relaxing and warm. Once again it is Thursday, which means it's time to share three things, three thoughts, three whatever-is-on-your minds. 1. So, yeah, it snowed here Tuesday night. To be perfectly honest, I was hoping for more, but beggars can't be choosers. School was out and work was cancelled. Hey, I'll take it. Thanks, Mother Nature. 2. Today is my father's 73rd birthday. Unfortunately the calendar is so full I doubt I will even get to tell him happy birthday in person-- even though he lives next door. But we'll celebrate appropriately when we can. 3. I need a vacation and am painfully aware of all the days, weeks and months to plow through before summer makes an appearance. Still, I am really tired and need a break. 4. (Because three is just a suggestion.) The Christmas tree is finally down--and it's not even Valentine's Day yet! That's it from here. Please share three or more or fewer things, whatever is on your mind, anything at all. These were taken last week from Haven Beach, which is the county beach closest to our infamously haunted Old House Woods. No ghosts were spotted this particular day. Instead, all I saw--even as I struggled in the bitter cold to make my frozen fingers work long enough to press the shutter button-- was beautiful scenery in an otherwise nondescript day. It's back to work for me today after a long arduous weekend. Here are a few more pictures taken from the public landing just below the Court House. Since the basketball game did not go as well as it should have last night, I am not talking about it today other than to say we should have won and I can't stand losing to Middlesex. Yes, I am a sore loser. That is all about basketball. And I hope never to write about losing again. It cramps my style. Let's turn our attention instead to the fact that Mathews County, Virginia, is a finalist in the Coolest Small Town in America contest sponsored by Budget Travel. 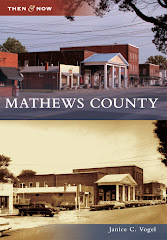 If you believe, as I do, that Mathews is a pretty cool small town, please click here to vote, and remember you can vote daily through February 25th. I consider Mathews one of the last frontiers, and if it isn't the coolest small town in America, it is now officially a contender. Here we are once again staring at the day called Thursday, where on this blog we are encouraged to share three thoughts--three random or related or semi-related things. Whatever happens to be on your mind, anything at all. Because there's no other way around it, I will go first. 1. Tonight the Mathews girls basketball team takes on Middlesex in a home match THAT WE HAVE THE ABILITY TO WIN. Sorry for the shouting, it's just that my daughter's basketball is about the only thing I feel passionate about these days. 2. I ran 8.6 miles yesterday, from Wayland Baptist Church to Salem United Methodist Church and back. Since I hadn't measured the distance in advance, I just told myself to run from one church to the other (and back) in the hopes that it would be at least six miles, which was my goal. When I clocked it with my car's odometer, I was shocked to learn I'd gone so far. Mind you, I have a smart phone that could have done this mapping for me. But thus far that smart phone's owner has not acquired the additional smartness required to use it to its full capability. 3. Thank goodness for Monday's Martin Luther King federal holiday. 2014 and the month of January have already worn me right down out, and I am looking forward to taking down my Christmas tree maybe a day off. That's it from me. If you have one, two, three or more thoughts to share, please do. And thank you for doing so. p.s. If you're local and are looking for something to do tonight, please come to the girls' basketball games at 6:00 (JV) and 7:30 (varsity) at the high school and cheer them on. I need help in the stands; it's not easy being an overly enthusiastic spectator. MATHEWS GIRLS BEAT WEST POINT LAST NIGHT. IN OVERTIME. FINALLY. A WIN. AND AN IMPORTANT ONE AT THAT!!! I'm yelling in all caps and blue letters because I'm no longer able to yell in real life (and certainly not in the school colors of blue with gold background, for goodness sakes) thanks to all the screaming I did last night. Anyway, this sort of news deserves to be yelled! And celebrated. West Point wasn't expecting to lose. It's been a long time coming, but our team finally clicked and played like the team they really are: a group of very talented young ladies. With very talented coaches. We have another game tonight against Gloucester. These were taken last Thursday from the public landing below the Court House called Town Point. The day was sunny, crisp and clear. And the tide was unusually low. As has been the theme here lately, there wasn't a hint of wind. they couldn't move an inch if they wanted to. Over the weekend we experienced quite the weather event. Saturday, a whirlpool of various hot and cool temperatures caused quite the brief but intense storm. Depending on who you ask we either had a tornado or the next closest thing. All I suffered was a few downed tree limbs. There are stories of trees landing on homes, but so far I've not heard of any major injuries, thank goodness. As quickly as it came, the storm passed. Sunday was filled with sunshine and thousands hundreds of Canada geese who insisted on using my back yard as a grazing ground. Upon arriving home from the grocery store and spying the trespassers, I took the car for a spin in the back yard to chase them off. Out of the corner of my eye I caught a glimmer of something sparkly and shiny coming from the sliding doors on the back corner of my house. After the geese were gone, I stopped the car in the middle of the back yard and glanced in the direction of the Something Sparkly inside my house. There standing proudly in my living room was my Christmas tree, mocking me, the person who should have taken down the lights and decorations instead of chasing off Canada geese or buying groceries. In other words, things are back to normal after the storm. And my Valentines Christmas tree still stands.